We’ve pulled the plug. At least for a year. We have spent the last 2 years in ongoing communication with banks (about a dozen, 4 of which we jumped through their hoops and met all of their contingencies). I can’t even begin to tell you how time-consuming and overwhelming it has been to repeatedly gather paper, scan & fax documents, and talk finances day in and day out — only to end up at the same place where you started 2 years later! 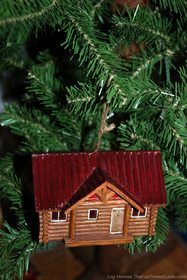 The fact of the matter is… we qualify for the loans, but there just aren’t enough log homes that have been sold recently around here for the banks to use as “comps” in order to determine a fair appraisal value for our proposed log home. They’re coming in way lower than we can build this log home for. And the banks won’t budge. So, we’ll check back with the banks later — when they decide to get back in the money-lending business again. In the meantime, we’ll be making minor improvements to our land, and saving enough to do the entry-level things ourselves… with cash. Luckily our GC is still working side-by-side with us and has vowed to see us through to the end. We are very fortunate in that regard. But It’s Our Dream Home! We love this log home that we’ve designed and the specific piece of land that we bought far too much to change the floorplan or build it anywhere else. It’s a custom log home… our dream home. Unfortunately, now is simply not a good time to ask for money for anything “outside of the norm”. Strike One: It’s made of logs, rather than two-by-fours. Strike Two: It’s custom, not your standard log cabin. Strike Three: No one’s selling log homes in this area from which to generate fair market value or “comps”. We’re in this for the long-haul… it’s just going to take longer than we thought to build it, that’s all. This just means that now we have even more time to decide what we really want in terms of things like flooring, countertops, appliances, furnishings, and interior decor. Who knows what interesting products might be available to us once it comes time to build this house! I thoroughly enjoy doing that type of research and perfecting our “dream home”, so that’s what keeps me going and what keeps me from getting too “down” about all these roadblocks we’ve faced over the past 2 years. Well, thanks for stopping by. You’ll see finished photos of our log home here… eventually! About a year ago, I got in the “packing” mode and started boxing up things that we don’t use everyday — in order to get a jumpstart on our move into our log home. Ha! Some jumpstart. I’m thinking it might be a nice way to start the New Year if I spend some time unpacking some of those things in order to make this house feel “lived” in again. Right now, it seems more like a temporary stopping place. Fortunately, we like our current home — a LOT. It’s laid out so perfectly for our needs, and it’s located in a part of town that we can get to anything we could possibly want in a matter of minutes. So, it will kinda be fun “moving back in” to this house again. Now that you mention it, I’m actually looking forward to re-decorating a bit and hanging pictures back up on the walls. Long story short… you know how they say to remove all “personal” photos before you sell your home? You do that so the prospective buyers will have an easier time picturing themselves in the house — rather than seeing framed photographs of you and your family everywhere. Well, I spent a couple days doing that awhile ago, and as a result, we’ve been pictureless for over a year now. Some fun pictures will certainly bring some life back into this house! Stay up to date with what's happening on The Log Home Guide. From Designing & Building your new log home to Decorating & Maintaining your rustic home... you'll always be the first to see these helpful tips as soon as we publish a new article.